Other parts of this story package are dedicated to explaining how to replicate Windows 7 features on a Vista or XP machine--and we offer so many suggestions that you may be starting to think that perhaps there's no compelling reason to upgrade to Windows 7 after all. If so, you should think again. Though Vista and XP users can enjoy some of the new operating system's goodies, either directly or by proxy, various highly desirable features are available only in the genuine article. Here are five that will require you to roll a 7. Device Stage: Whereas Vista barely seems to recognize the presence of cameras, phones, printers, and other external devices, Windows 7's Device Stage treats them like royalty. The operating system devotes a slick-looking status window to each device, so you can browse files, manage media, and perform other device-specific tasks. HomeGroup: At long last, Microsoft promises to take the pain and frustration out of home networking for users of its operating system. Set up a HomeGroup, and then add PCs and other devices--and without further ado you can share files, printers, and the like. Why did it take seven versions of Windows to get this right? Jump Lists: Like souped-up Recent Documents menus, Jump Lists provide quick access to application-specific documents and/or tasks. For example, you can right-click the Internet Explorer taskbar icon and choose from a list of frequently visited Web sites or from a list of available tasks (such as New Tab and InPrivate). Once you get started using Jump Lists, you'll wonder how you ever got along without them. Libraries: Most of us have documents, music, pictures, and video scattered across multiple folders on our PCs. Libraries are special folders in Windows 7 that catalog these items under a single roof, regardless of where you actually store them on your hard drive. And best of all, Libraries are easy to share within your HomeGroup. With Windows 7, the task of choosing a Wi-Fi network connection becomes an effortless, one-click affair. 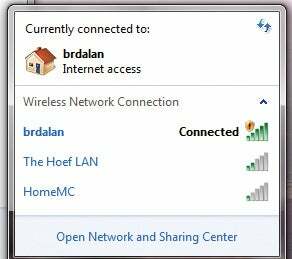 One-click Wi-Fi: Unlike Windows Vista, Windows 7 makes choosing a wireless network to connect to simple and convenient: Click the system-tray icon, and choose from the resulting list of available hotspots. Granted, you can find third-party connection managers for Vista, but nothing this streamlined and unobtrusive.